Honestly, I didn't expect that Nintendo would actually put non-amiibo downloadable content (DLC) into The Legend of Zelda: Breath of the Wild. No other The Legend of Zelda game (besides Hyrule Warriors, but that doesn't have The Legend of Zelda in the title for a reason) has paid-for DLC. This is a series that has prided itself on releasing complete, high-quality games while blazing its own trail, not following someone else's. It's an exemplary flagship series of a company that used to pride itself on releasing complete, high-quality games while blazing its own trail. Now none of that is true anymore, and let's even pretend that The Legend of Zelda: Breath of the Wild isn't derivative of Skyrim. The Legend of Zelda: Breath of the Wild has a predatory “Expansion Pass”, as explained by producer Eiji Aonuma in video immediately below and in text here if you click (just remember to come back to KoopaTV). $20 for two content packs (available for both Wii U and Nintendo Switch versions — more on which to get here) that you may not purchase individually. To clarify, that means the only thing up for sale is the Expansion Pass, which pre-purchases DLC Pack 1 and DLC Pack 2, and also gives you immediate bonuses. Let's examine their contents in detail. 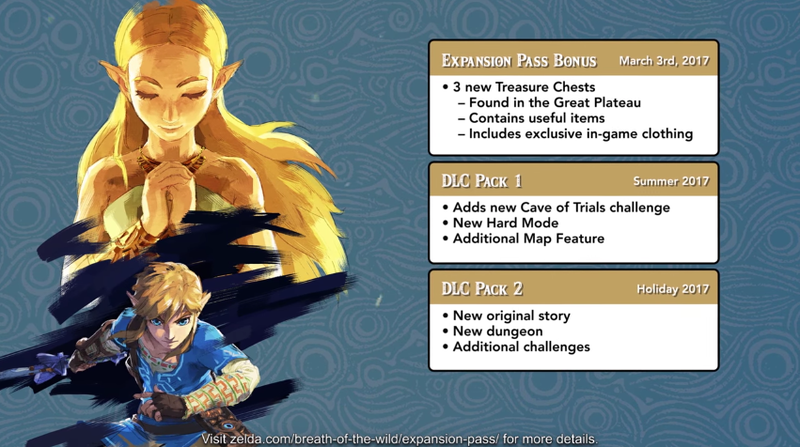 You get the Expansion Pass Bonus right away upon purchase, and the DLC Packs upon their releases. One of the treasure chests will include Link wearing a Nintendo Switch shirt, and the other two will include “useful items”, which doesn't mean anything. We can assume that those aren't all that interesting. A reminder: The Great Plateau is the game's starting area, so unless Nintendo is doing a pay-to-win system, those “useful items” will not be game-breakingly powerful. I mean, unless it is a pay-to-win system, which wouldn't surprise me. But you have enough dignity not to cheese through the game, right? By the way, Link is going to have all sorts of clothes in this game, as we've seen in the horribly long Nintendo Treehouse Live footage back at E3 2016. Unless the Nintendo Switch shirt has special powers, you're not going to be going very far with it. I'd hate to be that guy on the Wii U who buys what amounts to a Nintendo Switch advertisement. I'd rather use that $20 on an ACTUAL Nintendo Switch shirt. The Cave of Trials is like the Cave of Ordeals. I think. That's from The Legend of Zelda: Twilight Princess, which may I add had the Cave of Ordeals for free. The Legend of Zelda: Twilight Princess HD also had a hard mode included... for free. As did The Legend of Zelda: Skyward Sword. What makes this hard mode different? Who knows. There is a “new feature for the in-game map” but we don't know what that is. There's a new original story, a new dungeon (probably relating to whatever new story there is), and additional challenges (relating to the new dungeon, relating to the new story). Boiled down, it means there's going to be some kind of side-plot taking place in a dungeon somewhere, with presumably new assets used. Great. Will it be an hour's worth or what? Who knows. Some sucker is going to have to buy it and tell everyone else. Let's think about this in a rational, economic kind of way. $20 is a third of the purchase price of The Legend of Zelda: Breath of the Wild. The Expansion Pack is asking for a third of the purchase price for a costume, some “useful items” (also known as nothing noteworthy), a hard mode, an opportunity to fight a ton of different enemies in a condensed period of time (in a game about conserving resources, may I add), and a new side-plot with a new dungeon to go with it. Considering the sheer size of the world of The Legend of Zelda: Breath of the Wild, and how packed it promises to be, that's obviously not a good deal. In terms of economic value, Nintendo would be capturing most of the value. The reason they want this additional revenue stream is to make up for the fact that the game was supposed to come out a long time ago, and the continual delays cost Nintendo money. They're pricing the game at $60 even though it's been delayed for years, so this $20 is their way to try to make up for it. Think of it another way: Would you spend $20 on the contents that the Expansion Pass will give you if it was its own game? If you're not willing to spend $20 on a standalone game with three items in treasure chests, one dungeon with a story, and a hard version of that dungeon, then why would you spend $20 on an add-on of just those things? Yes, it's optional. No one is forcing you to buy the expansion pass. I'm just here to tell you that I don't think it's a good idea, especially when they're tight-lipped about what they'll actually include. You're essentially trusting that Nintendo will deliver a good value even you don't know what these things involve. Unfortunately for the consumer, they have no contingency plans and no ability to get a refund. All transactions are final, regardless of what Nintendo actually puts in the DLC. They want you to commit to buying these ahead of time. That's really dumb. Don't ever buy something without knowing what you're getting. That early committal is what Nintendo wants, and it's what you should never do. I have a history of opposing similar DLC announcements from Nintendo, like Mario Kart 8. I also have a history of opposing their implementation, as well, and of pointing out the economical information asymmetries that happens in these “season pass” transactions. I'm therefore well-aware that this isn't new for Nintendo, and I'm still disappointed that Nintendo is continuing this business policy. Nintendo was supposed to be different. Now they're becoming more and more like everyone else. Sad! Ludwig has no plans of getting the Expansion Pass for The Legend of Zelda: Breath of the Wild, and certainly not before he knows what's in it. That's how ObamaCare got passed, and that was a total disaster. The only DLC Ludwig has ever endorsed that everyone else purchase involves Phoenix Wright: Ace Attorney — Dual Destinies. ...It also involves Phoenix Wright: Ace Attorney — Spirit of Justice. He wasn't against them because of his cultish affiliation with the franchise. If you really do believe Nintendo is totally up-front and honest and wouldn't have a bad value on the Expansion Pass, the article published before this existed on the proven premise that Nintendo isn't a truth-teller. ...by the way I'm fully-aware that the debut of Wonderful Wednesdays obviously got delayed again. In my opinion, I'd just say, "Let's just wait." The DLC Pack releases in months, who's in a rush to know the details now? Honestly, I felt like this was inevitable. Seriously, Nintendo?! Are you releasing a Special Edition, and a MASTER'S Edition?! Plus, announcing DLC for a game in development for five years, before Zelda comes out?! What we're now in witness of is a more coorporate Nintendo, one bound to recover the profits lost from their Nintendo 3DS and Nintendo Wii U line-up. The Expansion Pass releases in less than a month. ...Two weeks, actually. If only the Wii U actually sold, then Nintendo wouldn't be so desperate. I meant the DLC Pack, not the Expansion Pack. I see it like a preorder, with preorder bonuses. The only way to get the DLC Packs are by purchasing the Expansion Pass. That's what it means by not being able to purchase DLC individually. If there's not going to be a Wii U shirt, I do not think the DLC is worth $20. Maybe $10 at the most. Wii U shirt commands a $10 premium?